I just purchased a used Washburn WI36 Telecaster-style guitar. I had tried several other teles, including a Fender MIM, a Raven's West, and a Bill Lawrence. Strangely, the Washburn sounded more like a vintage telecaster than the other three. I also had a philosophical problem purchasing this guitar, as it looks exactly like the Hannah Montana guitar [ ], but given the sound (and the price I got it for), I felt I had to purchase it. Thanks for that. That one is slightly different - must be the 'B' designation. My doesn't have the pearloid pickguard (which I asked Washburn about, and they don't sell them). It also doesn't have a 'set neck', although it describes having one, and then says it has a bolt-on neck. Hmmm. Anyhow, the more I play this thing, the more I'm impressed. It really offers every sound you expect a tele to. Mine is some where between the standard tele cream and a TV yellow with a plain white pickguard. It looks nice with the rosewood fretboard. Only the second single coil pickup guitar to join the Idol Series (The WI66PROG is the other one), the WI36 has all the twang you'll ever need. Similar to the Washburn that Joe Don Rooney of Rascal Flatts uses. I know a guy, accomplished banjo player, who got a WI-36 for his teen son. LOVES the guitar, althoug he did drop some new pickups in it. I've messed with it a bit. Build quality and intonation aren't a problem. Seems pretty solid. No, this isn't quite the same guitar as the Hanna Montana one. The Hanna Montana one is a Lyon by Washburn, and I suspect a far lower build quality to this. 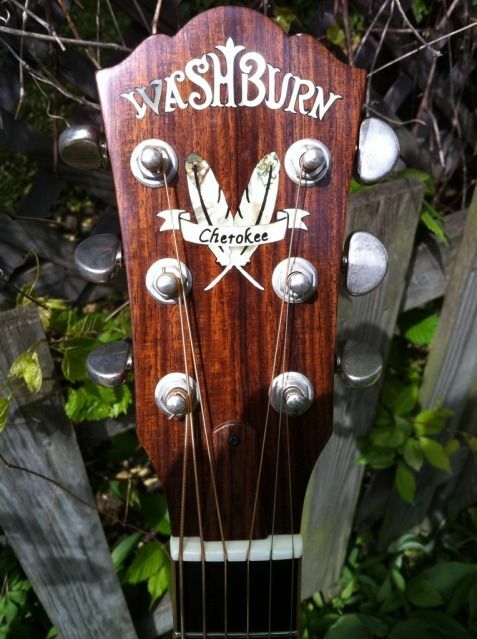 This is part of the Washburn Idol series. I have since posting this found several online retail listings for it, and it appears that it's a solid basswood body, and the pickups are Washburn made. I'm very impressed with the sound of the bridge pickup - very tele-like. The neck pickup is usable, but probably should be upgraded. It's a shame they've been discontinued.